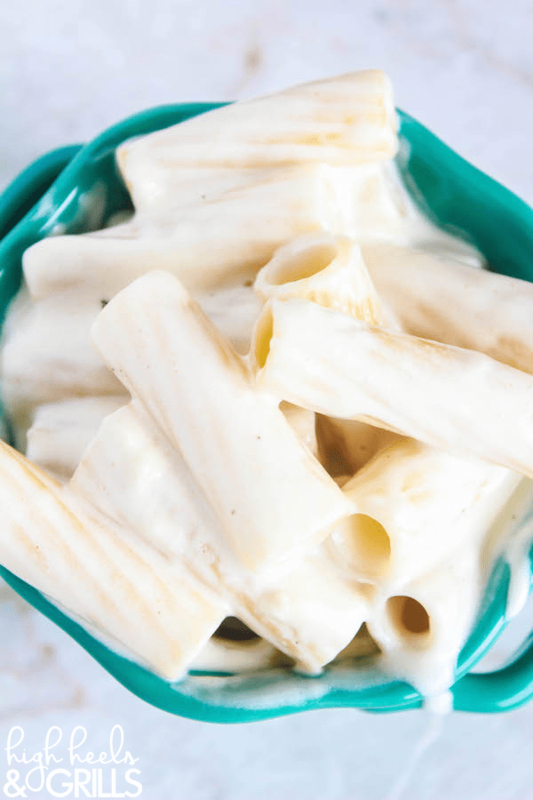 This Cream Cheese Garlic Alfredo is super quick and easy to whip up and tastes better than any restaurant Alfredo I’ve ever had! 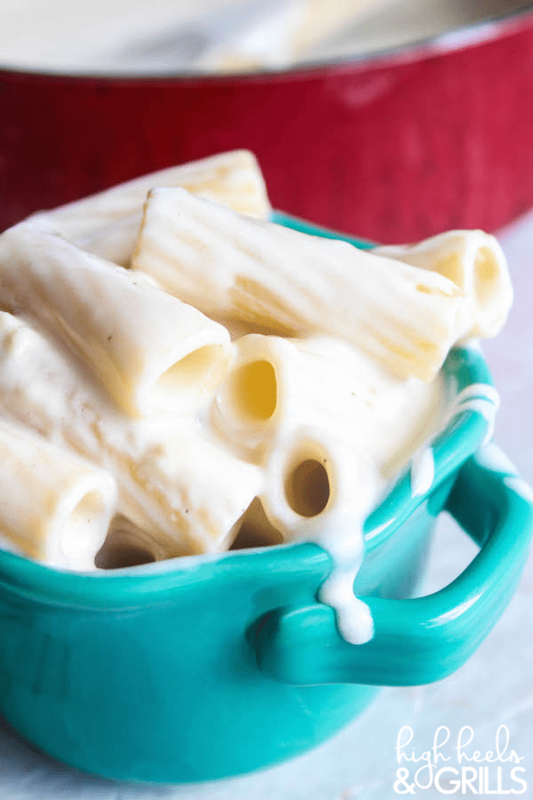 Made from butter, cream cheese, garlic powder, cream, and Parmesan – it tastes so good. I would usually respond with, “Hey hot stuff lady of mine, I’m working on it as we speak…” Then I would promptly forget. Which brings me to the subject of today’s post. Yesterday I actually had some pretty good ideas in mind for today’s post, but then Sarah whipped up this Cream Cheese Garlic Alfredo. Yes, you heard right. SARAH made this one. Then how can this be a Man Monday? Well, let’s be honest men, sometimes our ladies are better than us and let me tell you – this Alfredo is better than any Olive Garden Alfredo. No joke. Therefore, my idea hunting for today’s Man Monday came to a screeching halt when I realized, as the light shone through the window and illuminated my very soul, that this recipe – though not crafted by me – was SO enjoyable, that I had to steal it for Man Monday. So, there you have it. I didn’t make this Cream Cheese Garlic Alfredo. But I sure enjoyed it. A lot. And it is worthy of any Man Monday. Why? Well, what does Man Monday stand for? Easy, delicious, and testosteroni meals that any guy could make for his lady. This one sure fits the bill. 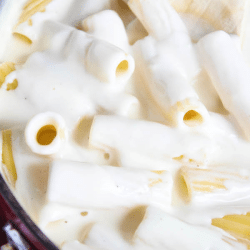 This Cream Cheese Garlic Alfredo is super quick and easy to whip up and tastes better than any restaurant Alfredo I've ever had! Made from butter, cream cheese, garlic powder, cream, and Parmesan - it tastes so good. Cook pasta according to package directions. Strain, rinse under cold water, and set aside. Once melted, add the cream cheese and garlic powder and stir with a wire whisk until smooth. Add the cream, a little bit at a time, while whisking. Add the chicken stock and stir well, smoothing out any lumps. Stir in Parmesan, salt, and pepper and bring to a boil, while stirring. 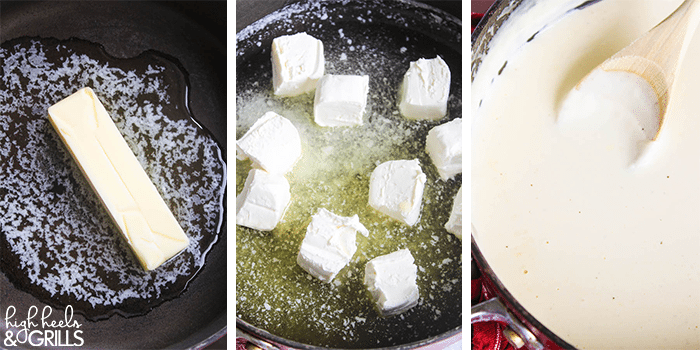 Once boiling, reduce heat and simmer for 3-5 minutes, until desired consistency. 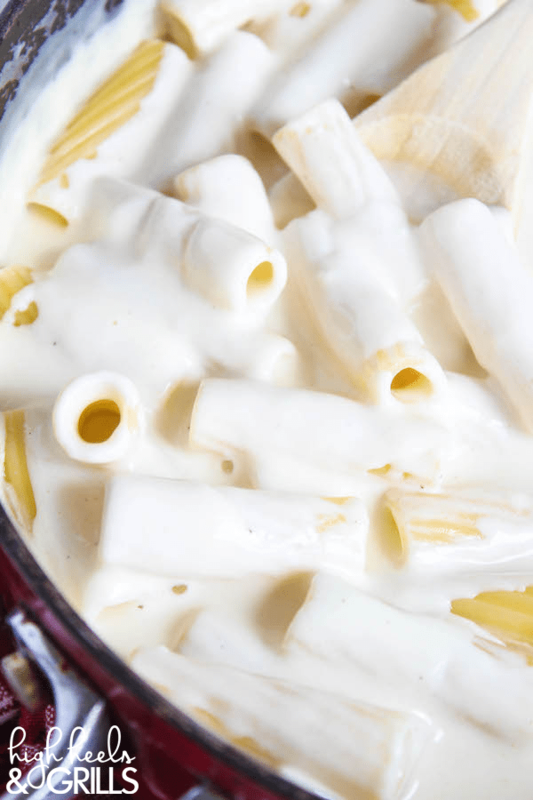 Toss Alfredo sauce with pasta and serve warm.